Stems: Up to 6 feet long, trailing to decumbent, grayish-green, pubescent with matted hairs; tendrils absent. Leaves: Alternate, simple, on stalks .1 to 2 inches long, quite variable in shape, narrowly oblong with projecting basal lobes or triangular-lanceolate to ovate-elliptic, usually much longer than wide, main portion sometimes long and narrow, often deeply indented basally, .5 to 3 inches long, .1 to 1.5 inch wide, densely gray-pubescent; margins lobed or toothed, rarely entire. Inflorescences: Flowers usually solitary, occasionally 2 or 3, on stalks in leaf axils. Flowers: Calyx, 1/4 to 1/2 inch long, densely pubescent; corollas bell-shaped, .6 to 1.2 inches long, .75 to 1.5 inches wide, white or pink, sometimes with a reddish center; corolla margins with 5 sharp points or projections; stamens 5, slightly unequal; anthers brown; style 1; stigmas 2. Fruits: Capsule, nearly spherical, smooth, 1-4 seeded; seeds black, glabrous. Habitat: Dry disturbed areas, prairies, plains, and hills; sandy, loamy, or rocky soils. Forage Value: Quail will eat the seeds and white-tailed deer will eat the leaves. 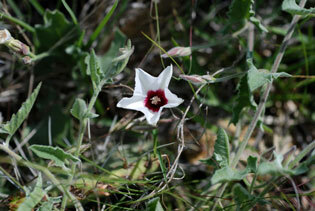 Comments: Gray bindweed does not form large patches like field bindweed Convolvulus arvensis.